Thanks to an extended good-weather window, we were able to get out on the water three days in a row- Sept. 23-25! Although working three 14 hour days in a row was exhausting, the data collected made it well worth it. We sighted more than 40 whales each day we were out. We are now processing the data collected and identifying the whales we photographed in the bay these past few days. As of right now, we have identified over a dozen whales that were seen for the first time this season. Some of the whales have not been seen since 2006. The white water and bustle of a surface active group. Many of the whales we saw were engaging in Surface Active Groups (SAG). 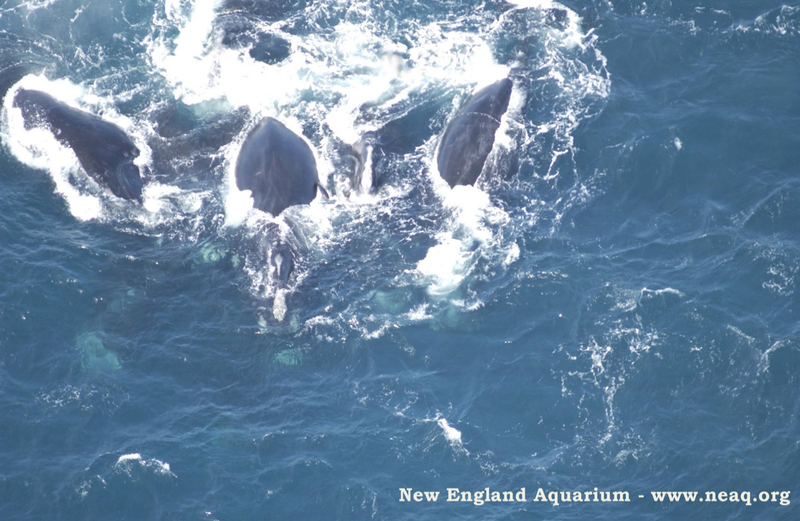 On both Sept. 23 & 24, we came across SAGs comprised of more than a dozen right whales! With the exception of Meridian (Eg #1403) most of the whales in one SAG were not in the other. There are currently a lot of right whales in the Bay of Fundy (more than 130 identified so far). The past three days allowed us to document that, but we know there are more whales in the bay that we have yet to photograph - some we have seen in the distance but have no photographs to prove it. This is frustrating given that the remnants of hurricane Kyle are at our doorstep and coming in without an invitation. We are all hoping that Kyle's rain and strong winds will be short lived and we will be able to get a few more days on the water before our season ends in early October. Video of a 12 animal SAG on Sept. 24th. The whale with the wrapping entanglement scar around its head is Meridian.